Wooden rakes used for traditional country tasks such as haymaking looked set to disappear in the British Isles, but with the resurgence of low-impact farming and, in particular, the scything of grass, traditional ash (Fraxinus excelsior) rakes are making a come back. 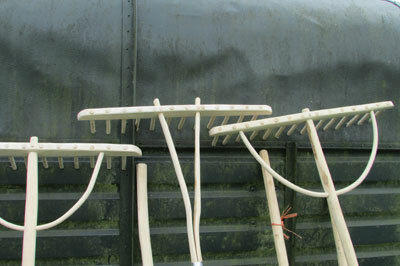 Handcrafted wooden rakes are light, well balanced and an item of beauty as well as a practical tool. 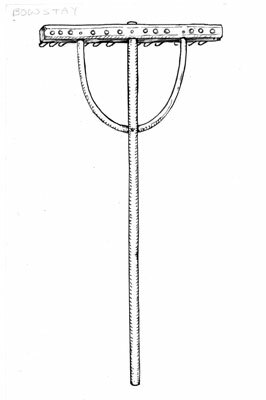 The two main types of hay rakes are the bowstay rake, formed with a bow of hazel to support the rake head - northern in origin - or the split-handle type found in the south. 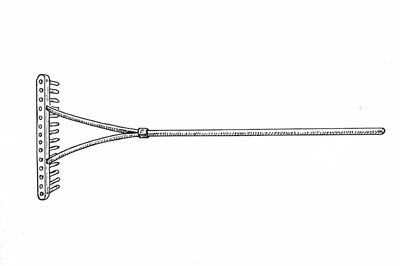 Larger drag rakes were used in fields without rocks and bumps where the extra width was useful without increasing effort. The size of a rake is chosen depending upon the type of grass to be raked and the height of the user. Having a well-balanced, light rake is essential, especially if you are to be raking all, or most of, the day. 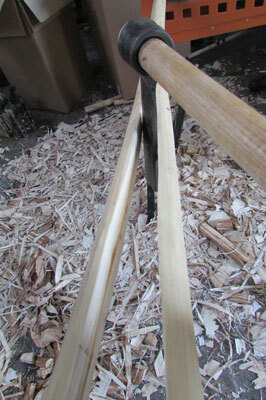 Another important factor is the smoothness of the stail - handle. 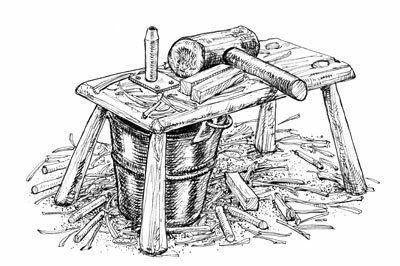 The stail must slide easily through the hand as it is drawn back and forth during the raking process. Although a rough pair of working hands will smooth it with continued use, ensuring a smooth stail to begin with is better. 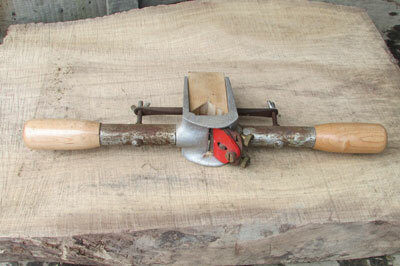 A stail engine is used to do this - an adaption of a rounding or rotary plane with a block of wood clamped to it. An adjustment on the block by loosening the screws creates a smooth taper along the stail. The head is also usually made from ash and is cleft. Holes are then bored for the tines - the prongs that stick out of the head - which are again made from ash. The size of the rake can be adapted for the purpose of its intended use. Choose a six-month seasoned ash pole for the stail of about 38mm diameter and remove the bark using a draw knife. Next, set the stail engine to smooth the stail and create a gentle taper. 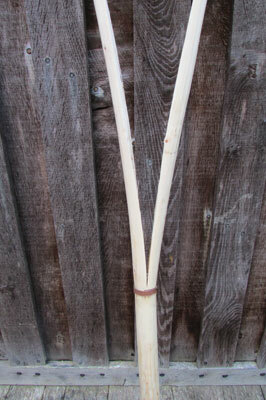 Cleave the stail using a lath froe - or use a Japanese ripsaw - down the pole for approximately 60cm - See Fig 1. 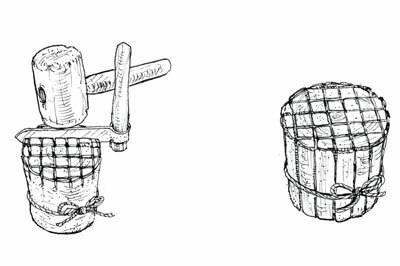 Prior to cleaving, the split must be secured with thick wire or tin plate where it the split is to stop and meet the fully round part of the stail. This will prevent the stail from being split completely in two and will stop it opening any further - See Fig 2. The split ends that go into the head can be further shaped to about 12mm diameter with a draw knife or rounding plane. The tines are cleft to ensure that they are strong. 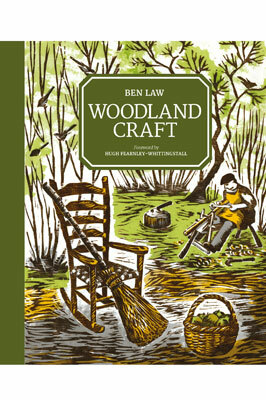 Take an ash log of about 30cm diameter and cross cut it into rounds 140mm in length. Mark a grid on the top with a pencil and cleave out the tine blanks using a froe and maul - See Fig 3. Hammer the tine blanks through a tine cutter to produce the finished tines - See Fig 4. These should be about 12mm in diameter. Leave the finished tines to season for a month or more or dry them out in a greenhouse or near a stove for a couple of weeks. Cleave the rake head from a round of about 100mm diameter and shape with a side axe and draw knife to create a lightweight head. This head should be made with greenwood to help it shrink tight onto the handle and tines. The head should finish with dimensions of approximately 71cm x 38 x 38mm. Drill two holes for the split stail to attach to the head. Check the diameter of the split stail with calipers and then choose the appropriate drill bit. 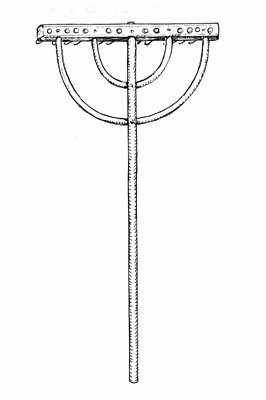 A nail is hammered through the head to secure each split half of the stail. Some rake users prefer a slight angle for the stail from the head so the angle of drilling should reflect this. Mark and then drill holes into the head for the tines. The shrunken diameter of the tines can be checked with calipers to ensure the right-sized holes are drilled. The head, being green, will shrink and the tines will be gripped tightly, so no other fixings are necessary. The tines should be lightly sharpened with a knife to finish.